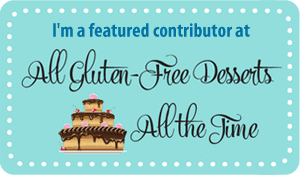 I had the realization that even though I have almost 100 recipes here on Flippin’ Delicious, I don’t have a single recipe for gluten-free banana bread. I do have an amazing Peanut Butter Banana Blondie recipe (which is also included in my cookbook) but not a single banana bread recipe. That was a grievous sin that had to be immediately corrected. So here is my recipe for gluten-free banana bread. It is soft, but doesn’t crumble apart. The browned butter adds a slight nuttiness, but you could easily substitute oil in the bread itself if you live the dairy-free way. Unfortunately there is no dairy-free flavor substitute for browned butter, but the bread will still be delicious! If you have a stand mixer it makes mashing the bananas super easy. You just toss the whole bananas in and beat them with the paddle attachment and then add the other ingredients and mix as instructed. That being said, this banana bread is mixed up very easily without the use of a stand or electric mixer so if you don’t have one, no worries! The bread itself is slightly sweet. I didn’t want to make it too sweet because I knew I was going to be drowning it in dreamy browned butter frosting. Let me tell you about that frosting. I saw Yammie’s recipe for zucchini bars with browned butter frosting. I waited anxiously for an opportunity to make them. It took me an entire week, but it was well worth the wait. Soft bars and the frosting, OH the frosting! It took a LOT of self control to not eat ALL of the frosting with the spoon. Somehow I controlled myself just enough to have some frosting left for going on top of the zucchini bars. 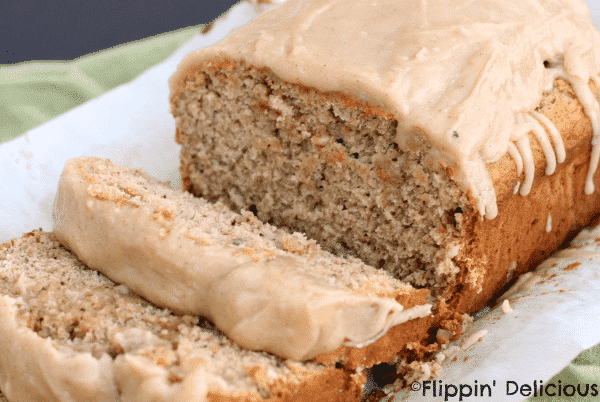 Since those bars I’ve been dreaming of browned butter frosting, which inspired me to make my own version of that heavenly browned butter frosting for my banana bread. The frosting on the top is pretty sweet.. And life-changingly amazing. The brown sugar and browned butter perfectly enhance each other. I made several changes from Yammie’s frosting recipe. I dissolved my brown sugar by heating the browned butter, milk, and brown sugar in the microwave before adding the powdered sugar. Once I added the powdered sugar, just before frosting the banana bread, I heated the frosting up again to help it pour smoothly over the bread, and set up like a smooth and shiny glaze. The result, moist gluten-free banana bread drizzled (or drowned) in sweet and nutty browned butter frosting. The perfect bite of banana bread! 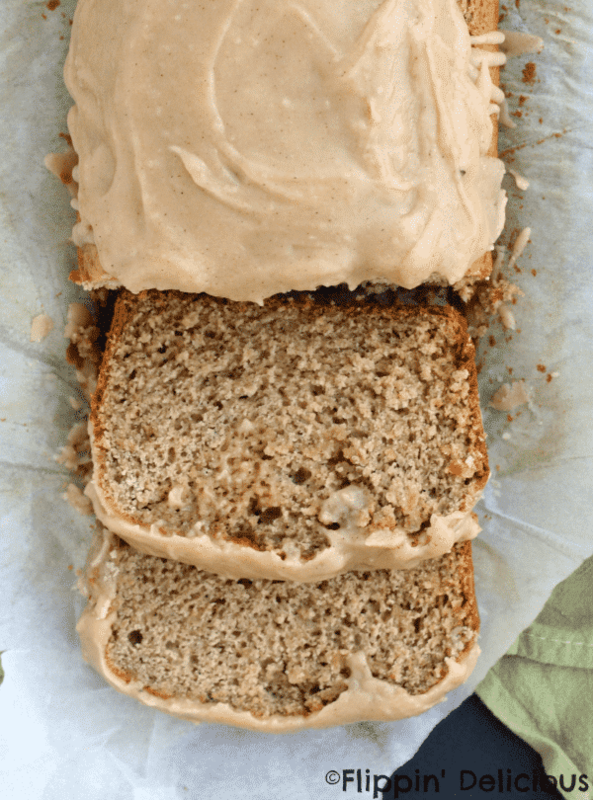 If you are looking for a healthier banana bread recipe, (hey, I don’t eat everything drowned in brown butter frosting!) I think you’ll love my friend Taylor’s Paleo Coconut Flour Banana Bread. Preheat the oven to 350F. Grease and line a 9x4 loaf pan with parchment paper. Mix together the mashed banana, sugar, browned butter and eggs until smooth. Add the remaining banana bread ingredients and mix until just combined. Let cool in the pan for 10 minutes before removing from the pan and frosting. In a small microwave safe bowl mix together the browned butter, brown sugar, and milk. Add 1 cup of powdered sugar and stir until smooth. If you want the frosting to be thicker add an additional 1/4 cup. Just before frosting the banana bread heat the frosting in the microwave for another 15-20 seconds. Drizzle/pour over the banana bread. Allow the frosting the set up slightly before slicing the banana bread. Linked up at Allergy Free Wednesday, Gluten-free and DIY Tuesday, and Gluten-free Wednesday. This looks incredibly moist and delicious!! 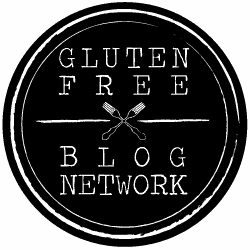 Thank you so much for linking up to Gluten Free & DIY Tuesdays. I keep hearing of brown butter, but I haven’t tried it yet. Your frosting looks yummy! Looks wonderful! I just made a posted a recipe for banana bread that uses actual brown rice, and see that yours has rice flour in it. I’m not very familiar with the gluten-free diet but am tempted by this recipe! That looks amazing! I can’t wait to try it! Hi, thanks for sharing your recipe, just wondering what brown butter is? Hi Denese, I was planning on linking to a tutorial for how to make browned butter, but I forgot. Here is a great tutorial: How to brown butter, a love story. In short, browned butter is amazing! It is nutty, slightly sweet, and butter. I look for all sorts of ways to use it now. What is browned butter? Is it cooked? If so, how do I do that? Thank you! This looks amazing!! I can’t wait to try this recipe! Hi Christy, I was planning on linking to a tutorial for how to make browned butter, but I forgot. Here is a great tutorial: How to brown butter, a love story. In short, browned butter is amazing! It is nutty, slightly sweet, and butter! The butter is melted and then you continue to cook it until the milk solids just start to brown. Be sure to remove the butter from the pan as soon as it is finished or it will continue to cook in the warm pan, and burn. This looks so. good. Oh my! This looks and sounds delicious. I can’t wait to try it. I even have some overripe nanas I was just trying to decide what to make with! This looks so good, Brenna! Pinned. It’s so nice not to have to miss out on banana bread! I made this recipe today; because of a dairy sensitivity I used non-dairy shortening. I made them into muffins, and baked them for 20 min. Delicious. Thanks for the recipe. I’m so glad that they turned out, muffins are a great idea! I’m glad that the non-dairy shortening worked, and thanks for letting everyone here know that it did. Gorgeous picture and recipe Brianna! .. now I’m starving! Hi Petrina, browned butter is butter that has been melted and then continued to cook until the milk solids separate from the fats and brown. It has an amazing nutty flavor! I was planning on linking to a tutorial for how to make browned butter, but I forgot. Here is a great tutorial: How to brown butter, a love story. This bread looks dreamy Brianna!! I don’t suppose you would deliver it so we can have it for breakfast tomorrow??? I just made your bread recipe and I made them into 6 larger muffins. I baked for 18 minutes and then tetedhem for doneness and put them back in 4 more minutes. They were perfectly done. could hardly wait for them to cool so I could put the frosting on. They are delicious! I taught my 11-year old grandson how to make brown butter. That frosting recipe I had not had in many years and instantly reminded me of my Mother. Thanks for the recipe. Muffins sound delicious! I’m so glad that they worked out. Baking with kids is the best thing ever, I’m so glad that your grandson helped you. I love baking with my 2-year-old daughter. Thanks for the recipe. My struggle with gluten free baking with rice flour is the gritty texture of the finished product. Is this normal or am I doing something wrong? I also notice the batter is very “stretchy”. I’m just curious if baking with almond meal flour and/or coconut flour would be the same afa texture? I loved to bake before I was told I needed to be gluten free. Now I don’t bake or I do with flour and just don’t eat what I bake. Any suggestions? Thanks. Rice flour can have a gritty texture if it isn’t milled finely, if you have issues with gritty baked goods I’d try getting your rice flour from a different source. My rice flour blend that I use in all of my recipes doesn’t have the gritty issue that many gf flour blends do because I have a higher starch ratio. Thank you so much for this post!! I recently became gluten-free for health issues and I almost cried over the fact that I could never make my banana bread recipe again. This has definitely lifted my hopeless spirits! You are very welcome Vickie! This is a delicious banana bread. I was a little short on banana by about l/3 of a cup but it still turned out wonderfully moist and tasty. I added about 3/4 of a cup of blueberries which tasted great and also was visually pleasing. (Dusting the blueberries with flour help distribute them nicely) Thank you for a great recipe. THIS BANANA CAKE IS THE BEST!!!! followed the instructions for mixing only thing i did was bake this at 350 for 50 minutes (per another reviewers suggestion). and i had no problem with the batter spilling over my 13X9 pan. this cake was very moist and tender and the flavor of banana was perfect. next time and there will be many i will add pecans. thank you for sharing this one!!!!!!!!!! Excellent banana bread with a really fine texture and moistness. Great! Might add a 1/2 tsp nutmeg and a 1/2 tsp cinnamon next time but otherwise perfect. I’m glad you liked it Luis! I made this recipe last week and it was impressive! My bananas were a little small so I also threw in a ripe pear. I was worried about how it would come out of the pan since I was out of parchment paper. I lightly buttered the pan and dusted with a Tablespoon of flour. The loaf (full sized) came out beautifully and cleanly. The texture was so moist and fine. We ate it with cream cheese instead of the icing. Perfect flavor balance. Not too sweet, but sweet enough. I wanted it to last more than one day so I hid it in the fridge in a ziplock bag. It was still perfect three days later. It didn’t crumble, was still moist, and the taste was great. Wow! Wow! Wow! I’m so glad that you and your family enjoyed it!